The Vauxhall Pleasure Gardens (also known as Spring Gardens) were opened by the Tyers family in 1661 and reached the height of their popularity in the early 1800s, with 20,000 visiting on one night in 1826. Their winning formula combined music, illuminated fountains, fireworks and light refreshments in an Eden-like atmosphere. The gardens originally combined genteel areas (where orchestras played and visitors promenaded in their finery) and 'dark walks' where couples could enjoy each other's company in some privacy, if not in comfort. This combination took some policing, and the Tyers employed their own policemen, probably the first organised police force in London. Casanova was, perhaps inevitably, one well known visitor. His memoirs record that a male friend discussed an acquaintance in the following terms: "It was one evening when I was at Vauxhall, and I offered her twenty guineas if she would come and take a little walk with me in a dark alley. She said she would come if I gave her the money in advance, which I was fool enough to do. She went with me, but as soon as we were alone she ran away ...". Charles Dickens was less impressed by the Gardens' 'faded splendour' when he visited them in daylight in the 1830s: 'We walked about and met with a disappointment at every turn; our favourite views were mere patches of paint; the fountain that had sparkled so showily by lamplight presented very much the appearance of a water pipe that had burst; all the ornaments were dingy, and all the walks gloomy'. Growing competition from early music halls and other public entertainments caused the proprietors to become increasingly innovative and offer a wider range of attractions, such as lion tamers and tightrope walkers. 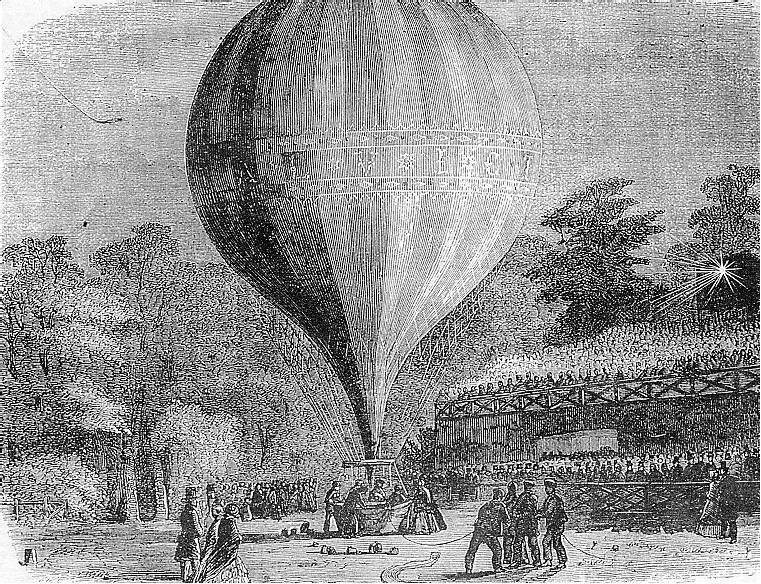 They were particularly famous for balloon ascents:- see 1849 engraving, above. It was not particularly easy to get to Vauxhall - at least until Vauxhall Station was opened in 1848 mainly to service the gardens. The nearest Thames bridge was the often very congested London Bridge. But there were many boatmen willing to ferry passengers across and along the river, which was much slower moving than now. Click here for more information about the history of the River Thames. 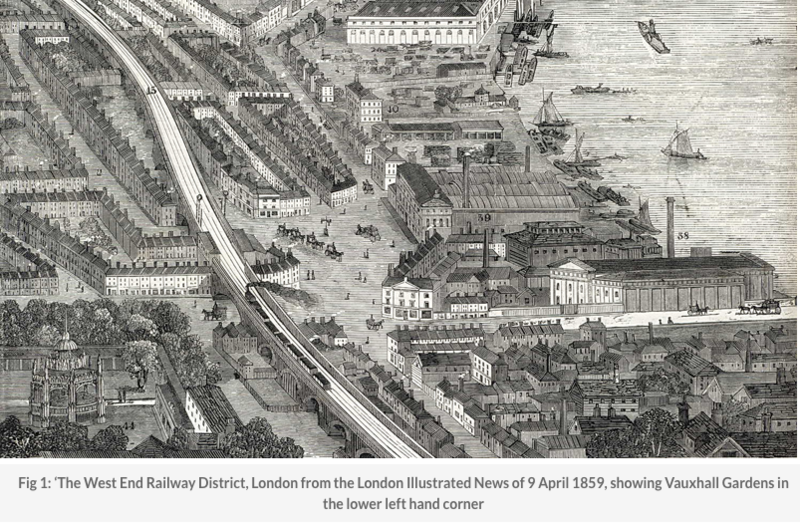 This 1859 drawing shows Vauxhall in the year that the Gardens finally closed. There were other pleasure gardens in London, including at Marble Hill on the river near Twickenham and Cuper's Gardens (aka Cupid's Gardens) down river opposite Somerset House. English Heritage are planning a partial reconstruction of the pleasure gardens within the much larger Marble Hill Park. 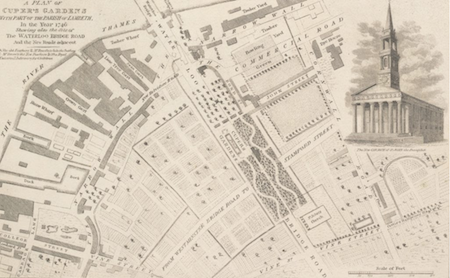 The three most prominent London pleasure gardens were at Vauxhall, Marylebone and Ranelagh. They all thrived as a result of the prosperity of the 1700s which in turn resulted from a relatively stable and democratic British Government and growing international trade, much of it passing through London. 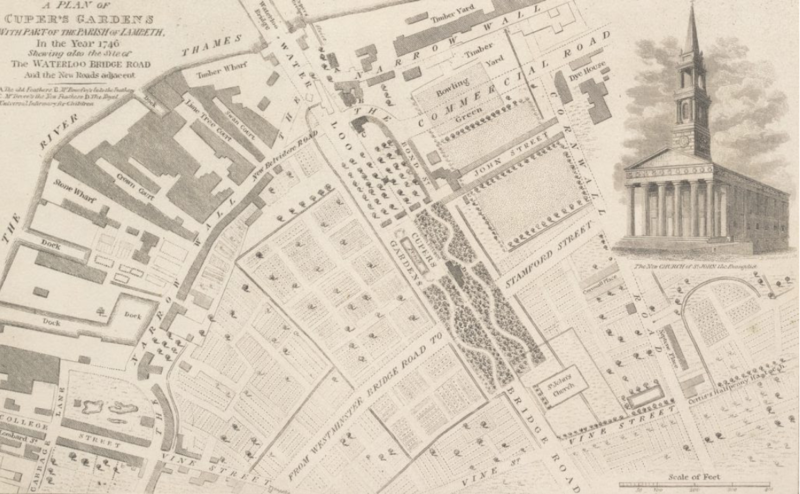 As a result, many merchants and professionals found that they had the time and money to visit the opera and pleasure gardens, of which Vauxhall was the most fashionable. 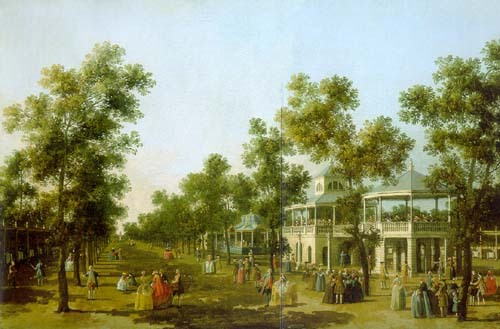 The Vauxhall gardens therefore became a model for the Tivoli Gardens in Copenhagen, and numerous other pleasure gardens around the UK and Europe. Marylebone Gardens were created when Marylebone was a village separated from London by fields and market gardens. It was situated in the area which is now between Marylebone Road, Marylebone High Street, Weymouth Street, and Harley Street; its site was developed as Beaumont Street and part of Devonshire Street. Ranelagh Gardens remain very attractive to this day - they are next to Chelsea Bridge Road on the other side of the Thames - and can be seen as part of a trip round the Chelsea Flower Show. Follow this link for more information about "Vauxhalls" outside London. Vauxhall also gave the Russians their word for "railway station" which is pronounced "vokzal". I am indebted to Professor John Tingley of York University, Toronto, Canada for drawing my attention to the explanation for this in an article by Lucien TesniËre:- Les antÈcÈdents du nom russe de la gare - in Revue des Ètudes Slaves XXVII (1951) pp 255-266. TesniËre explains that the "Vauxhall" at Pavlovsk was the destination of the first Russian railway line (built in 1832 from Vitebsky railway station in nearby St Petersburg) and so the word Vauxhall became synonymous with railway station. Professor Tingley is not aware that anyone has questioned M. TesniËre's explanation, and it is repeated in all Russian etymological dictionaries. The Russian Vauxhall had been developed by Michael Maddox, an English entrepreneur and theatre manager, who had previously run entertainment venues in England as well as St Petersburg, and had of course visited Spring Gardens. Vauxhall Pleasure Gardens were, however, certainly visited by Russians. You might like to look at a delightful letter from the Russian historian Karamzin. Thackery extolled the virtues of the pleasure gardens in "Vanity Fair" although they had by then begun to acquire an unsavoury reputation, and a number of brothels became well established in the surrounding streets, including at "Sluts Hole" - now a stables in Fitzalan Street. One visitor told the owner that "he should be a better customer ... if there were more nightingales and fewer strumpets". Ironically, the advent of the railways killed off the gardens and they closed in 1859. The site was subsequently built upon and I suspect that the present Spring Gardens were created by wartime bombing, aimed at the railway line. Caneletto painted this famous view of the Grand Walk in 1751. Here is a another view of the Grand South Walk around 1790. And here is a view of Spring Gardens in April 2002, looking East. A more detailed history is elsewhere on this website. David Coke, who has written a comprehensive history of Vauxhall Gardens, has also put up a website which accommodates all the detailed information for which he did not have space in his book. The website also includes a short list of links to other sites, together with useful information and/or illustrations related to the gardens. Click here if you want to email David. A large number of beautiful prints are available from The Collage Collection of the Guildhall Library. And a 16 page history of the gardens is available from the Vauxhall Society.